Cala Vadella, Ibiza. A welcoming, family-run, restaurant with friendly, efficient service and a menu for even the most discerning palate. Right on the beach at Cala Vadella, Ibiza. A welcoming, family-run, restaurant with friendly, efficient service and a menu for even the most discerning palate. Right on the beach at Cala Vadella, Ibiza. 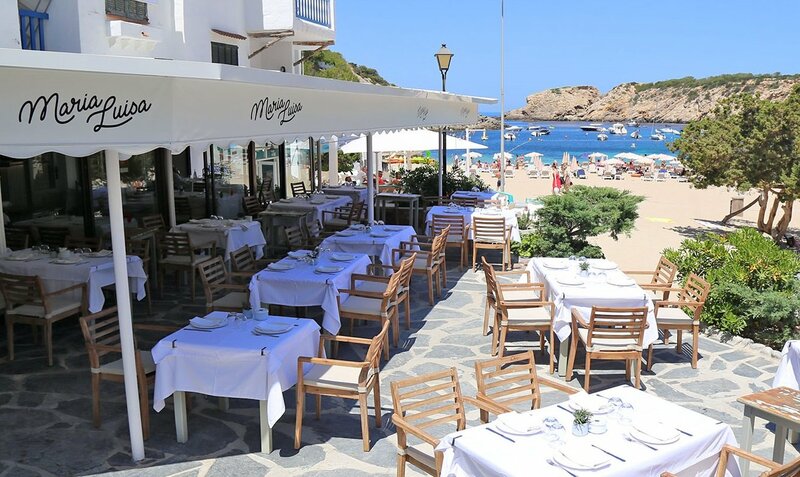 Nestled in a corner, on the edge of the golden sands at Cala Vadella, sits the charming restaurant Maria Luisa. Shaded by evergreen's and pretty parasols on a decked terrace, with stunning views of the picturesque bay, it is the perfect restaurant to enjoy a very chilled Lunch or Dinner in an authentic Ibicencan atmosphere. A popular venue for International and local discerning palates. Select fresh Lobster and Shellfish from a well-stocked tank or, savour the flavours of Spanish specialities with a variety of Paellas. Although fish is their forte, as their reputation shows, they also serve excellent meat and steak dishes and a good selection of wines. Family owned and efficiently run by mother and son – Maria Luisa and Jordi – you'll also find a warm welcome and excellent service. Whether you're out as a family, a group of friends, or a romantic couple, you'll enjoy the Maria Luisa. Reservations are recommended on Sundays and Fiestas.